For some the highlight is the gift shop. Kawaii! On my final full day in Yokohama I went to an exhibition (I guess that’s the right word for it) in a shopping mall opposite the Yokohama Museum of Art called ‘Orbi’. 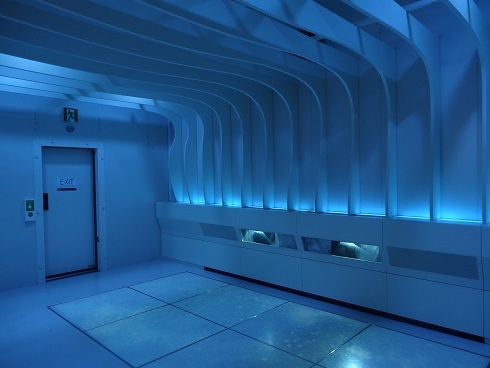 Although I had never heard of it before, my wife had said it would be an interesting thing to go to (although she had never been) and with a day to kill, and after checking out the website, I thought it looked interesting enough to warrant a visit despite its rather steep entrance price of 2,600 yen (about $26). WOW. 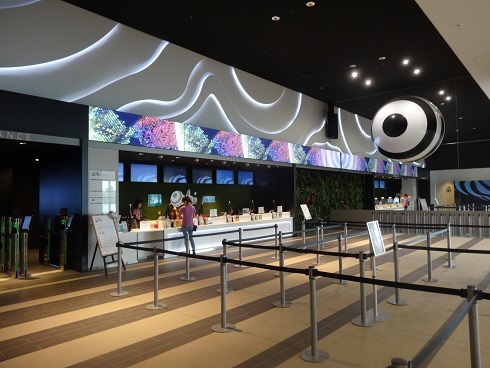 So basically the aim seems to be that visitors to this attraction will feel they are there, in nature, with the animals and insects and the like. What I found it to be was really a lot of brilliantly shot nature footage, using super fast cameras capturing I don’t know how many frames per second, featured over a number of displays. It began with ‘AnimalPedia’. 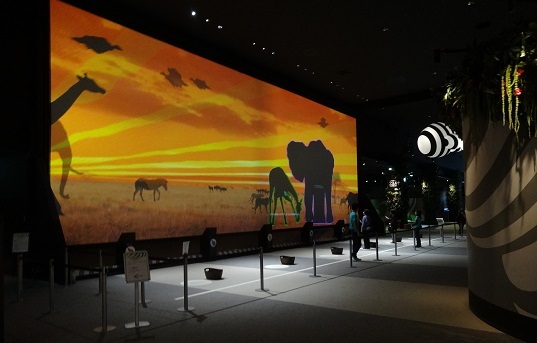 A giant screen where animal shapes pass in front of you and if you reach out and move your hand you can pull one up and read various stats about it. In Japanese – it must be said that bar the pamphlet the majority of the display is just Japanese or the English explanations appear to have been created by using Google translate, which doesn’t work so well. See below for a clear example of this! No, I don’t understand English suddenly either! 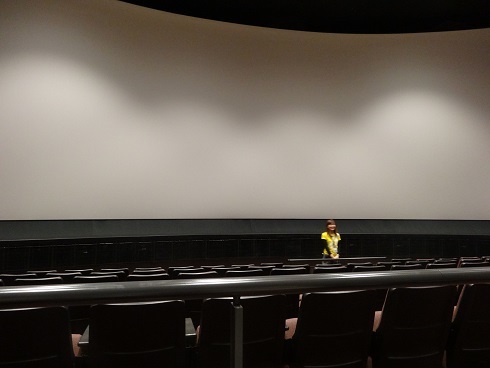 Before the big show started, in the cinema. The main attraction is a 20 minute film entitled 23.4 – so named because that’s the axis rotation of the Earth from centre. There’s a curved screen with two other screens at just beyond 90 degrees to your eyes. The opening sequence had a lot of fast moving boxes spinning and converging and to be honest, I felt bloody sick within 30 seconds. Then it settled down and we were taken to Africa and Antartica and the film was very impressive. There are a number of exhibits similar to this. One where you stand in the middle of a herd of more than a million wildebeests as they try to escape the clutches of crocodiles. The floor moves and it’s very violent. 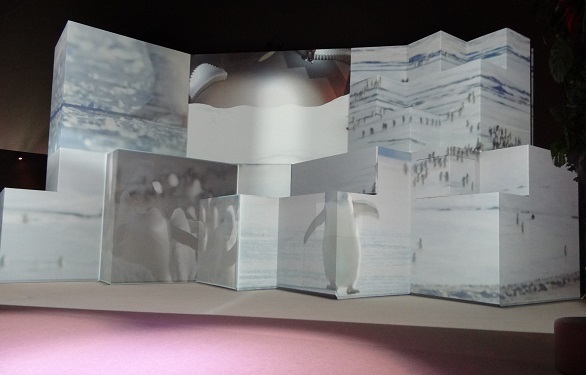 Images are projected onto a series of white cubes in the centre of the exhibit. You can watch a short film taking you to the depths of the ocean, or see a 3-D film about the Komodo Dragon of Indonesia, which perhaps was the most interesting of the displays, although as with most modern 3-D productions, didn’t really need to be in 3-D.
-89.7. It didn’t get quite that cold! One display gives you a bird’s eye view of flying across Africa, or part of the Americas (there are two rooms), which was kind of cool, and one of the more memorable activities, this one with no films involved, is called -89.2. You go into a series of rooms with a jacket provided, each colder than the other. Finally a strong wind blows at you at minus 20 degrees for 15 seconds, giving you a taste of what it’s like to be a penguin living in the Antarctic. Over all, it’s interesting I guess. I entered after paying my 2600 yen, so I was determined to see every exhibit, which took around 2.5 hours. It wasn’t busy at all though, and the price is probably why. I’m not sure I found it all that interesting to be honest, and if you’re backpacking on a budget in Yokohama, then I would be giving this one a miss. There are a lot of staff employed there, and boy are they genki – that’s basically over-enthusiastic and happy all thetime. Welcome to Orbi. Not a lot in the queue to get in! They don’t like people taking photographs at all, although it’s permitted in some parts. Understandable that you can’t take photos or shoot movies of the BBC films, but they are pretty tight on the photos to be honest. If the 2600 yen fee isn’t making much money, and it looks like it was a pretty expensive thing to set up, then they provide a number of opportunities for you to have your photo taken in front of a green screen and added to any number of sceneries. 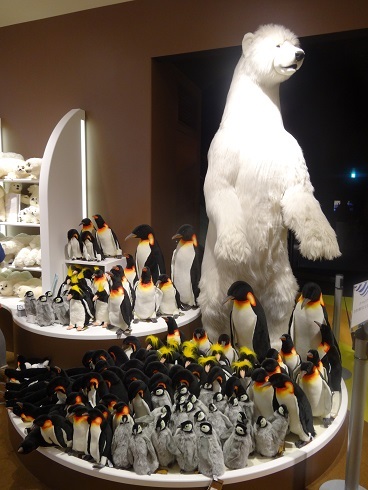 Then, the gift shop is seriously big with so many cute items the cashed-up locals probably won’t know where to start! If you have time and money to burn, then maybe take a look at ‘Orbi’ – especially if you are a nature and nature photography lover. Otherwise, there are many things to see and do in Yokohama that are far better bang for your buck in my opinion. I’d give it 2/5 stars. I got to tell ya, this place sounds very interesting! $26 seems a bit steep though. 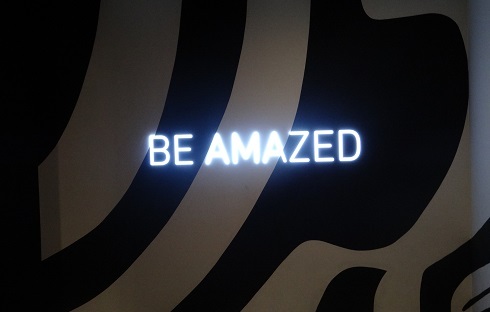 it’s certainly… different! Thanks for reading! I hadn’t heard of it either, but it looks pretty interesting.